LG still relies on Qualcomm processors in most of the world, but the South Korean company has been hard at work on its own series of Nuclun chips. Now it looks like LG could be testing a new processor that puts Samsung’s best to shame. 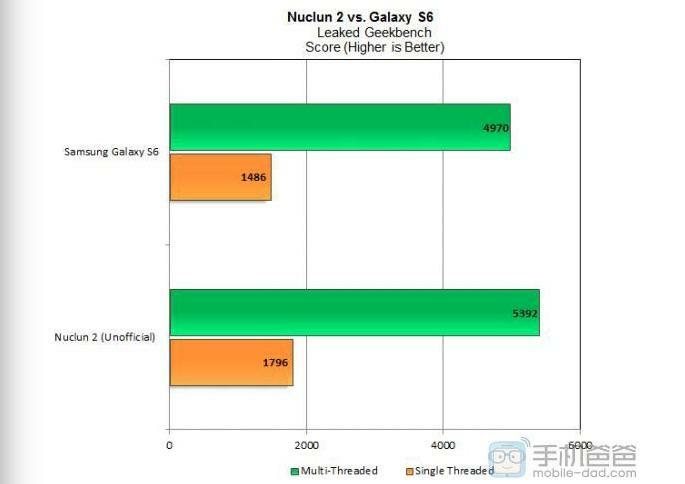 The Nuclun 2 scored a 5392 multi-threaded and a 1796 single-threaded on Geekbench. By comparison, Samsung’s Galaxy S6 scored 4970 and 1486. The S6 packs Samsung’s own Exynos 7420 processor, which the company also uses to power its just-announced Galaxy Note 5 and Galaxy S6 edge Plus. It’s unclear when (or if) LG’s Nuclun 2 will show up in a new smartphone. The company is expected to release a new device, possibly the G Pro 3, later this year, so maybe that’s when the chip will make its official debut. Earlier reports suggested the 6-inch handset could pack a Snapdragon 820, but Qualcomm’s new chip won’t actually hit the market until early next year. Of course, it’s possible this new leak could be fake. It’s relatively easy to mock up some benchmark scores, so we wouldn’t get too excited for now. Still, if LG really is cooking up a killer new chip it could make the company’s next phone even more exciting when it finally arrives.